I’ve been a UI (user interface) enthusiast for darn near the entirety of my Mac user experience; for those playing along at home we can pinpoint that all the way back to a revision b Bondi Blue iMac running MacOS 8.5 acquired in November 1998. Custom icons, appearance themes, UI mods, and all sorts of related, unsupported hacks were fun, exciting, and sometimes disastrous avenues of learning how to dig around the nuts and bolts of the operating system. Over the course of years my enthusiasm waned somewhat, and with the continued advancement and refinement of Mac OS X there was little reason and little opportunity to mess with big immersive UI mods. Though there were, and still are, a good handful artists to follow, the UI community fragmented into niche groups that had the appearance of being hype-driven exclusive clubs leading the way to a new “Glossy, Grey” UI world order with visions of dollar signs spinning in their heads. Thankfully, this phase seems to have nearly fizzled out; UI artists are creating/releasing some neat stuff these days. A good amount of these are little UI mods that make a big impact on the user experience, combing several together can really make your workspace feel special. So, in appreciation of this resurgence I’d like to share some of my favorite current UI mods and make a commitment to share more of these more often here at the Rampant Ranch™. First up is a nifty Traffic Light UI mod that is easy to install and apply; Lights by PrekeshC. 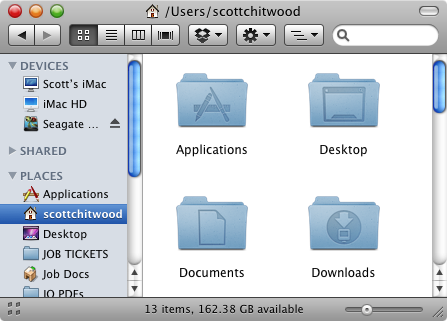 This is a fantastic creation that puts the big smack-down on Snow Leopard defaults; rich colors, highlights, and bevels to whet your UI palate — just gorgeous! Installation is real easy, grab the files and let’s go. There are two items we need to replace in here: ‘ArfFile.bin’ and ‘SArtFile.bin’. Hang tight on that thought, we’ll get back to it. Go up one level in the directory, highlight the ‘Resources’ folder and use the ‘Get Info’ command in the Finder to make changes to ‘Sharing & Permissions’ settings. You’ll need an admin password to unlock the settings. 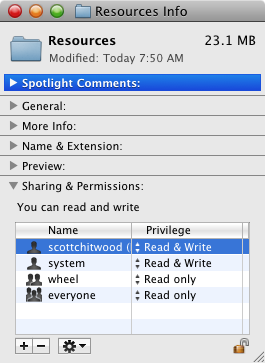 After unlocking, add yourself to the ‘Sharing & Permissions’ settings, give yourself ‘Read & Write’ priveleges, then finish off by selecting the ‘Apply to enclosed items…’ command, and exit the dialog. Go back into the ‘Resources’ folder. 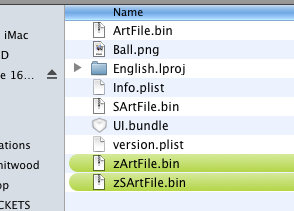 For back up purposes and easy replacement, rename ‘ArfFile.bin’ and ‘SArtFile.bin’, then copy the new files from download into ‘Resources’ folder. That’s it. Restart your Mac to make the install complete. Scott used to run ResExcellence, after taking it over from Michael Coyle. He also ran Rampant Mac for many years, highlighting the best of Mac customization and digital art. Scott has kindly donated some of his articles to ResExcellence for redistribution.